Paul Gauguin, Where do we come from? What are we? Where are we going?, 1897-98, oil on canvas, 139.1 x 374.6 cm (Museum of Fine Arts, Boston)Where do we come from? What are we? Where are we going? is a huge, brilliantly colored but enigmatic work painted on rough, heavy sackcloth. It contains numerous human, animal, and symbolic figures arranged across an island landscape. The sea and Tahiti’s volcanic mountains are visible in the background. It is Paul Gauguin’s largest painting, and he understood it to be his finest work. Where are we going? represents the artist’s painted manifesto created while he was living on the island of Tahiti. The French artist transitioned from being a “Sunday painter” (someone who paints for his or her own enjoyment) to becoming a professional after his career as a stockbroker failed in the early 1880s. He visited the Pacific island Tahiti in French Polynesia staying from 1891 to 1893. He then returned to Polynesia in 1895, painted this massive canvas there in 1897, and eventually died in 1903, on Hiva Oa in the Marquesas islands. Gauguin wrote to his friend Daniel de Monfried, who managed Gauguin’s career in Paris while the artist remained in the South Pacific, “I believe that this canvas not only surpasses all my preceding ones, but [also] that I shall never do anything better, or even like it.” Gauguin completed Where are we going? at a feverish rate, allegedly within one month’s time, and even claimed to de Monfried that he went into the mountains to attempt suicide after the work was finished. Gauguin—ever the master of self-promotion and highly conscious of his image as a vanguard artist—may or may not have actually poisoned himself with arsenic as he alleged, but this legend was quite pointedly in line with the painting’s themes of life, death, poetry, and symbolic meaning. Not only does Gauguin’s text clarify some of the painting’s abstruse, idiosyncratic iconography, it also invites us to “read” the image. Gauguin suggests that the figures have mysterious symbolic meanings and that they might answer the questions posed by the work’s title. And, in the manner of a sacred scroll written in an ancient language, the painting is to be read from right to left: from the sleeping infant—where we come from—to the standing figure in the middle—what we are—and ending at the left with the crouching old woman—where we are going. Stylistically, the composition is designed and painted to recall frescoes or icons painted on a gold ground. 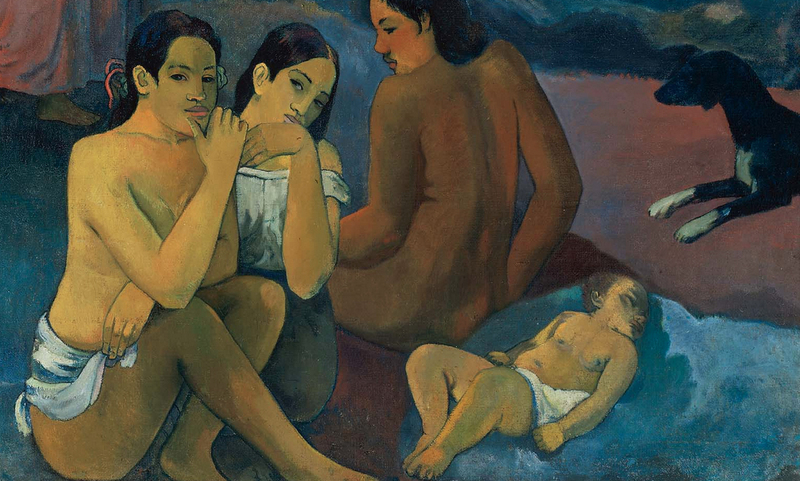 The upper corners have been painted with a bright yellow to contribute to this effect, and the figures appear out of proportion to one another—“deliberately so” as Gauguin wrote—as if they were floating in space rather than resting firmly upon the earth. 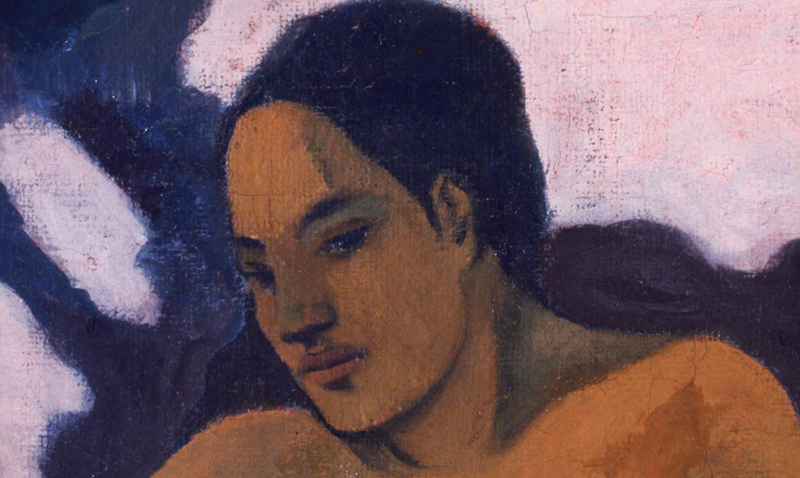 These stylistic features, along with Gauguin’s enigmatic subject contribute to the painting’s “philosophical” quality. And as is common with other Symbolist works of this period, precise, complete interpretations of Where do we come from? remain out of reach. The painting is a deliberate mixture of universal meaning—the questions asked in the title are fundamental ones that address the very root of human existence—and esoteric mystery. Although Where do we come from? is painted on a large scale similar to the decorative public panels created by the French artist Pierre Puvis de Chavannes (an artist Gauguin admired), Where do we come from? 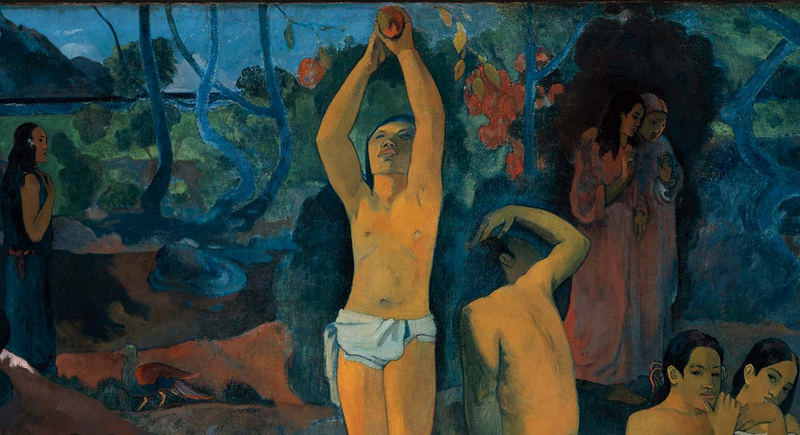 is essentially a private work whose meaning was likely known only to Gauguin himself. 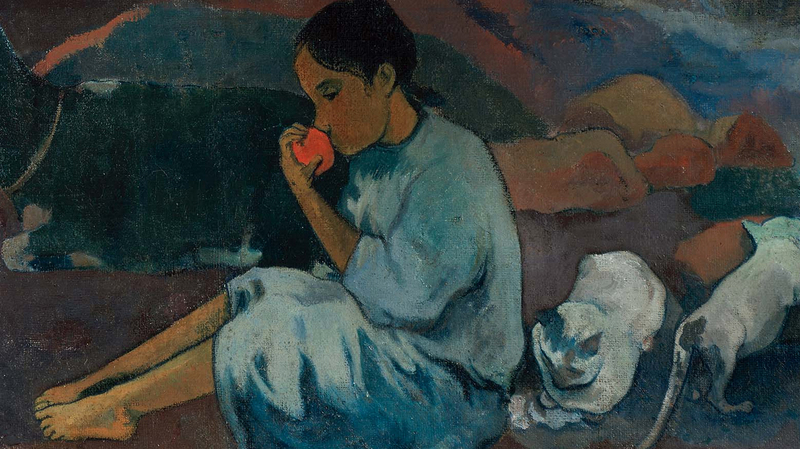 A few months after completing the painting, Gauguin sent it to Paris along with several other works of art, intending that they should be exhibited together in a gallery or an artist’s studio. He sent de Monfried careful instructions about how Where do we come from? should be framed (“a plain strip of wood, 10 centimeters wide, and white-washed to resemble a mural”) and who should be invited to the exhibition (“in this way, instead of crowds one can have whom one wants, and thus gain connections that cannot harm you.”) The concern Gauguin reveals in the details indicates his continued awareness of the Parisian art market, which remained a central focus even as he exiled himself on a small tropical island on the other side of the globe. In November and December 1898, the group of Tahitian paintings was displayed at the gallery of Ambroise Vollard, a former law student turned art dealer who specialized in vanguard artists. Vollard seems to have had difficulty selling the “large picture,” as Gauguin called it. Efforts by the artist’s Parisian friends to collectively acquire the painting and donate it to the French state were never realized. Where do we come from? shuttled between galleries and private collections in France and Norway until the Museum of Fine Arts, Boston, purchased it in 1936. 1. “The Wisdom of Paul Gauguin—Artist,” International Studio, volume 73, number 291, 69. 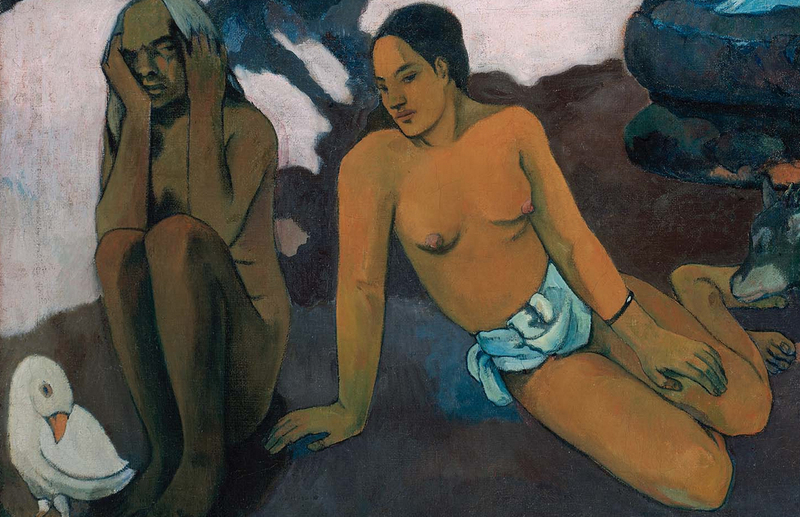 Cite this page as: Dr. Noelle Paulson, "Paul Gauguin, Where do we come from? What are we? Where are we going?," in Smarthistory, August 9, 2015, accessed April 24, 2019, https://smarthistory.org/gauguin-where-do-we-come-from-what-are-we-where-are-we-going/.